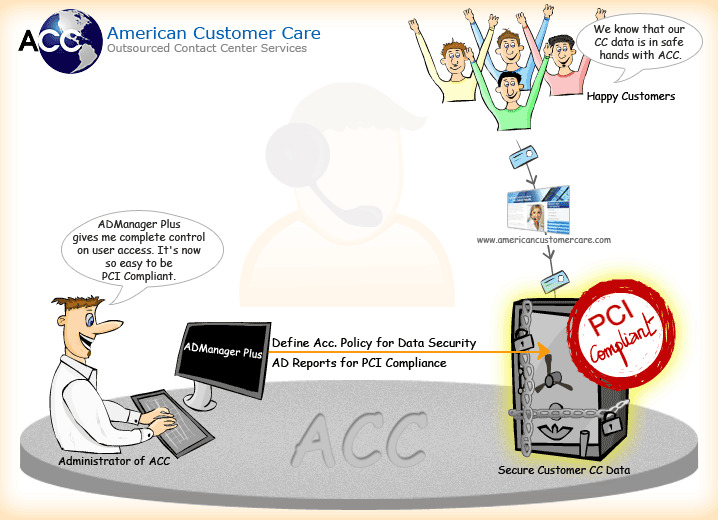 Case Study of American Customer Care - Improved data security uses ADManager Plus in its PCI Compliance Project. "Restricting access to customer data is critical for our business. ADManager Plus helps us take control by defining account policies and periodic monitoring"
- Rich Hawley, Senior Network Engineer, American Customer Care, Inc.
American Customer Care Inc., is a premier provider of high quality customer contact center services. Founded in 1986, the company currently operates ten customer contact centers with over 2000 employees, 1800 web-enabled workstations, and 2000 Interactive Voice Response (IVR) ports located throughout Connecticut, Iowa, New York, Pennsylvania, Texas, and Wisconsin. Granular reporting on Active Directory objects, especially the users. Periodic monitoring of Active Directory User accounts. Enforcement of account policies to maintain compliance. Make Global changes without having to resort to vb scripting. The company's quest for the right AD Software, resulted in the scrutiny of ManageEngine ADManager Plus. ADManager was instrumental in providing the following, and hence assisted ACC immensely in not only safeguarding customer credit card data, but also executing a successful PCI compliance project. A comprehensive reporting bundle with over a 100 reports on various AD objects. The ability to identify/monitor user accounts in AD. Facility to create Account policies and associate users to them. Centralized, web based intuitive UI that eliminates the traditional scripting needs. Moreover, all the Reports supporting the company's compliance with PCI standards, could be easily generated using ADManager Plus and used during Audits. American Customer Care is anticipating a possible shift in AD Account Management with the deployment of ADManager Plus. By delegating the task of creating and deleting user login to the HR staff, would not only reduce the IT workload but also keep a check on the stale ex-employee accounts. American Customer Care firmly believes that ADManager Plus will help reduce the risks and also give their clients peace of mind in terms of data security. The company knows that meeting PCI standards is not only critical for successful call center business but is also the right way to do it. End of day, the success of a business is determined by trust that is earned from clients. "With the reporting abilities of ADManager Plus, we are sure about our success in the PCI Compliance Project."